As I mentioned earlier this week, I’m dedicating this week’s Mac Gems to add-ons for Apple’s Mail email client. These bits of software let you give Mail new features and fill minor gaps in its functionality. On Tuesday I talked about a number of past Mail Gems that have been updated for Leopard; today I cover two new products. When it comes to performing common tasks, some people prefer to use the mouse, while others prefer keyboard shortcuts. Although I’m generally a keyboard person, I’m not as devoted to the cause as is my colleague Rob Griffiths, who probably hasn’t touched his mouse in several years. For me, the keyboard alternative has to be easy to remember and—perhaps most important—easy to use. MsgFiler also has several useful options. For example, you can copy a message to a folder instead of moving it by pressing Shift+Command+C; the original remains in its current location, but a copy is created in the target folder. You can also use MsgFiler to open a mail folder; just type the folder’s name, but instead of pressing Return, press Command+O. (You can instead click on Copy or Show, respectively, if you happen to be mousing around.) Finally, you can set MsgFiler to automatically mark Unread mail as Read when you file it. MsgFiler even works with MiniMail, which I covered earlier this week, and supports Undo for those times when you accidentally file something in the wrong folder. One thing that bugs me about Apple’s Mail is that the program often tries to display all attachments in the message window, regardless of the size of each attachment or how the sender wanted it to be displayed. This may be fine for small attachments, but I frequently receive large images and PDF files; opening a message with such attachments can result in Mail “freezing” while the attachments are rendered. It also means that when I print a message with attachments, the previews of the attachments are printed, as well. A nifty solution is Adam Nohejl’s Mail Attachments Iconizer 2.1 ( ; $15), a Mail plug-in that gives you extensive control over how attachments are displayed. Via a new section of Mail’s Preferences window, you can force particular types of files to always display as their icons. You can choose a different setting for each type of file: text and HTML; PDF documents larger than the size you choose; images larger than the size you choose; and images in HTML email. (This last option works only if images in HTML email are included as attachments rather than as part of the HTML layout.) In addition, because Mail has a difficult time rendering PostScript documents, Mail Attachments Iconizer forces them to always be displayed as icons. Another option I like is to always display the full name of each attachment; without Mail Attachments Iconizer, Mail shortens longer file names. And when I print messages in Mail, the messages print exactly as shown onscreen—which means no more multi-page printouts with PDF previews if all I wanted was the text portion of an email message. In addition to the ability to choose options individually, Mail Attachments Iconizer includes two pre-set configurations: one that sets everything to Mail’s default settings, and one that gives you the developer’s preferred settings. One glitch I found is that I sometimes had to quit and relaunch Mail for settings changes to take effect. Finally, Mail Attachments provides improved handling of the “content disposition”—an indication of how the sender wants attachments to be viewed—of incoming messages. According to the developer, Mail doesn’t respect this header, nor does Mail set the header properly on outgoing email; Mail Attachments Iconizer forces Mail to use content disposition correctly. Below is a table from the developer describing how Mail behaves with and without Mail Attachments Iconizer. Once you install Mail Attachments Iconizer, it's easy to forget about it, as it simply makes Mail work the way many other email clients already do. I would argue that the functionality provided by Mail Attachments Iconizer should be provided by Mail itself, but until it is, this is a useful add-on. 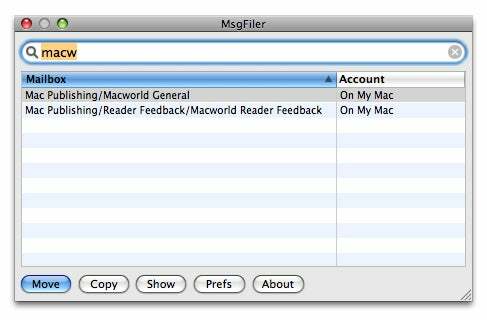 MsgFiler 2.0.2 and Mail Attachments Iconizer each requires Mac OS X 10.4 or later. Mail Attachments Iconizer gives you more control over how Mail displays and sends attachments.